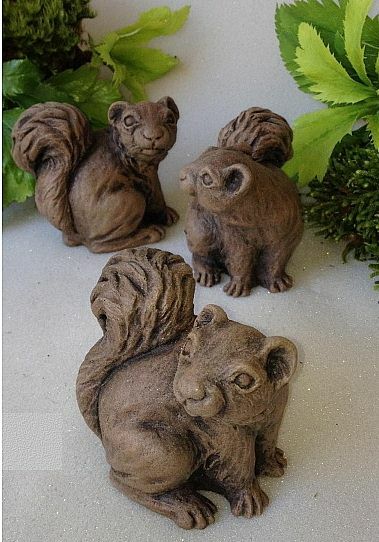 Here are three abundatly cute squirrels which will not run away! They are so cute they will melt your heart and they come detailed and fit for the tabletop or as gifts for friends. Dimensions: Each measures about 2-3"
One of our cute turtle figurines which are small and really cute! Set of three. Fiber reinforced concrete. One of our adorable little bear figurines for the desk or simply for giving away. Fiber reinforced concrete. Our set of baby deer figurines...so cute for the desk or as gifts. Fiber reinforced concrete. Our set of three raccoon cuties are just curious little ones...too small to cause any trouble. Fiber reinforced concrete. One of our set of curious frog figurines for the desk or as gifts. Fiber reinforced concrete. Our set of baby mouse cuties are curious little ones too! Fiber reinforced concrete. Sold as a set of 3. Our set of three little fox figurines are simply happy to be asleep. Fiber reinforced concrete.